At Altham Oak, we know that smaller internal carpentry elements can still display the results of fine craftsmanship and sound material selection. 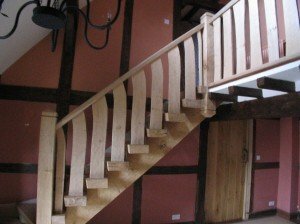 The bespoke oak staircases we create are stunning individual structures. 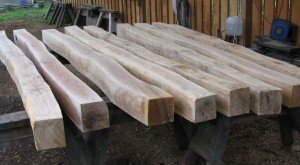 Regardless of awkward dimensions, irregular inclines and corners, Altham Oak’s master carpenters will strive to select the right timbers to suit the practical requirements of a property and the design vision of the owner. Sometimes a selected bent tree is the only way to do the job. Just a quick word to say how pleased we are with the end result………. The stairs are exactly what we wanted, robust, in keeping with the Oak framing of the house and also an artistic statement which is a feature now rather than just a way to the upper floor…..
A decorative beam by Altham Oak represents an attractive focal point for any room. The shape and grain of the wood lends a natural textured beauty to a fireplace, for example. 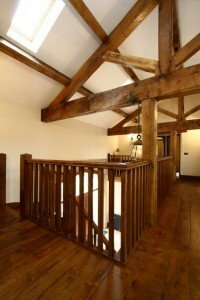 Decorative oak beams can also be structural. Our fireplace beams add a superb finishing touch to any room. 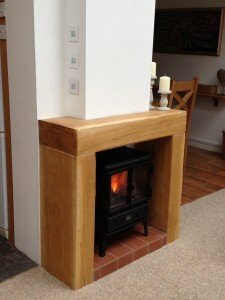 Our speciality is the hand-cut fireplace beam which adds character to your fireplace and can be tailored to your vision.